Bartlett Tree Experts has welcomed Jamal Barrett and Maxwell Sabel, two students from local Stamford, CT high schools, to work at their corporate headquarters this summer as part of the Mayor’s Youth Employment Program. Now in its third year, Mayor Michael Pavia’s program provides a select group of Stamford teens with real-world work experience as well as professional development. In addition to the 28 hours per week they are working at Bartlett’s office, Sabel and Barrett attend training sessions provided by the City on topics such as leadership and project management. “As soon as I found out about it, I thought this program was a wonderful opportunity for students and employers alike,” said Noel Dubak, Manager of Recruitment and Development for Bartlett Tree Experts. Dubak pointed out that lack of office experience is often a strike against young people looking for work, even recent college grads. She continued, “Getting this type of experience at such an early stage puts these students ahead of the curve, possibly for the rest of their lives.” As for the benefits to Bartlett, Dubak noted that in addition to the office help gained in the short term, forming relationships with motivated young people in the community is a smart investment in the future for any local company. Jamal Barrett, between his junior and senior years at Stamford High School, said that although his experience at Bartlett only began last week, he is already finding it challenging and useful. “We’re updating the equipment files,” said Barrett, “and it’s actually taught me a few things. I’ve learned about the financing process.” An active athlete, Barrett was captain of the Stamford High School junior varsity football team last year. He also volunteers at his church, the Greater Works Community Church of God, as the assistant sound technician. He has a strong interest in technology and hopes to attend UConn in the future. Maxwell Sabel, coming up on his senior year at West Hill High School, is grateful for the opportunity provided by the Mayor’s Youth Employment Program. As he put it, “I think it’s a good thing to put on your resume. And the things you learn like getting along with people and asking for direction will help me in the future.” Sabel volunteers with the Yearwood Center soup kitchen and is an active member of the St. Leo Parish youth group. He also plays lacrosse during the school year. He has a variety of interests and enjoys gaining hands on experience, which is part of what drew him to this program. Sabel and Barrett will continue to work at the Bartlett corporate office through August 9, and their training with the City of Stamford will culminate in a community service project around that time as well. Participation in the Mayor’s Youth Employment Program this year includes 75 students with jobs provided by 12 businesses and 17 nonprofits. The funding for jobs at nonprofits is provided by an additional 18 corporate sponsors. The F.A. 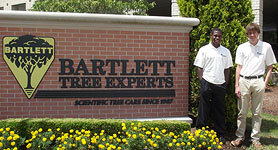 Bartlett Tree Expert Company was founded in 1907 by Francis A. Bartlett and is the world’s leading scientific tree and shrub care company. The organization’s current chairman, Robert A. Bartlett Jr., represents the third generation of Bartlett family management. Bartlett has locations in 26 U.S. states, Canada, Ireland and Great Britain. Services include pruning, pest and disease management, fertilization and soil management, cabling and bracing, tree lightning protection systems and tree/stump removal. Its corporate offices are located in Stamford, Connecticut.